While some are freezing their limbs off and getting their tongues stuck to poles in frigid temps — the buzzword I heard this morning on the news was “polar vortex” (*shudder*) — MainMan and I are making the most of our new town/beach life. This includes spending more hours surfing and stand-up paddling, and trying to get into better shape so we can enjoy said ocean activities for extended periods of time. Part of this process includes just getting on the water more and eating better. MainMan’s been a huge advocate of the Zone diet for years. We own two books on how it works and how to eat the Zone daily. I got the gist: less carbs = skinny butts. Balanced diet = better nutrition. But for whatever reason I’d been disinclined to jump on the bandwagon. I love my chips and dip, and pasta, and baguettes, and cheese, etc. etc. Well, much like I suddenly gave up meat on my 30th birthday to many a “What? !” and “Why! ?”, 2014 hit and I looked at my bowl of Special K thinking, “This is doing absolutely NOTHING for my body or for improving how it works.” So, with that, I decided I’d try hard to only ingest items (wine and beer, excluded) that had some sort of health benefit. I went to a website I thought might have some useful tips/ideas to get started, SELF Magazine, and low and behold they’re having a 14-day shape up plan. I printed out their healthy recommended grocery list. It’s not all Zone-friendly, as MainMan pointed out, but a hell of a lot better than any of my previous “must buy” lists. Mondays are our Sundays around here, as MainMan has Sunday and Monday off, so we devoted it to errands and cooking. MainMan made about 4 quarts of chili (unfortunately with meat so I can’t eat any of it) and for dinner we decided to have clams. Protein is big in the Zone diet and I can’t eat salmon and tofu every night so we have to mix it up somehow. 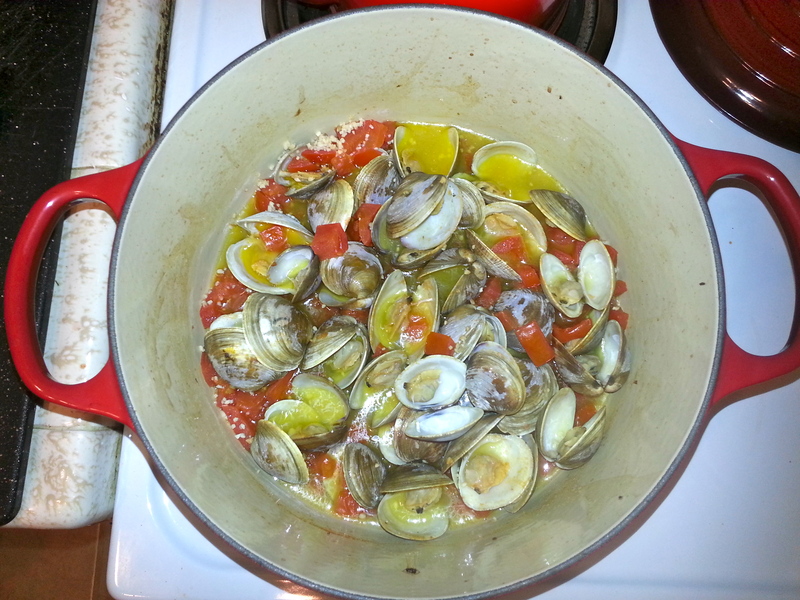 We bought 2lbs of clams from Gelsons and looked up a recipe that would work for us. I followed Seattle chef Tom Douglas‘ oven-roasted clams recipe from his cookbook “Seattle Kitchen,” though we skipped the chanterelles, olives and bacon. Sometimes keeping it simpler is better and the broth already felt crowded with tomatoes and garlic. It calls for 6 tablespoons of butter — we used about half that and you could probably get away with even less. The result was fantastic and I am definitely adding this recipe into the rotation. MainMan’s reaction to my food-gasmic response was, “Have you never had clams before?” I most certainly have, but none quite so good.